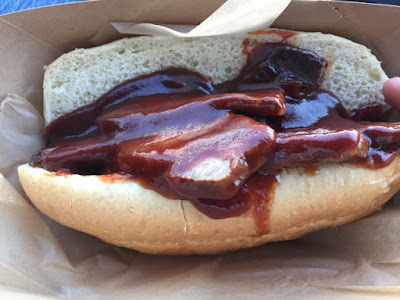 Last night the Dodger organization was kind enough to allow some of us bloggers to come and try some new food items and speak about the upcoming promotions. First I would like to thank David Siegel, the VP of Ticket Sales, and his team for coordinating this wonderful event. In addition, the Senior VP of Planning and Development, Janet Marie Smith was there to speak to the improvements of the stadium (the WiFi rocks!). Then executive chef Jason Tingley and his staff delighted the taste buds with culinary ballpark fare. As you know, I like to try the food items at the stadium, so this was right up my alley. And in preparation for the event, I made the sacrifice and worked out and fasted for 8 hours as to prepare the stomach for the festivities. First up, the nachos and corn. Yum. this was probably my favorite item. Sometimes, I just don't want the cheese all gooped on the chips. And this solves the problem, especially with the extra spiced corn on top. A home run in my book. This can be found at the La Taqueria stands. 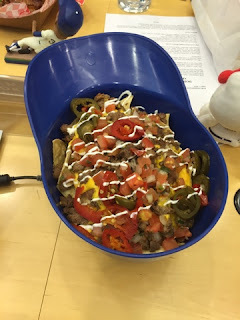 Next up, the famous nacho with carne asada in a Dodger helmet. This is enormous, probably enough for one family (or one Uribe - what too soon?). I have had this one before, and it will definitely fill you up. I could go with more chips though, although where to put them would be a difficult decision. This one gets a stand up double. 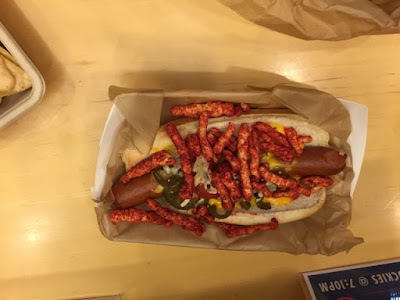 Next, we have one of the extreme loaded dogs with flaming hot Cheetos. Wow, this one is crazy. I actually didn't taste this one, since my ulcer was acting up already. It looked (and I heard from someone else) like this one was pretty spicy. I'll stick to the frito dog. This one gets an intentional walk. 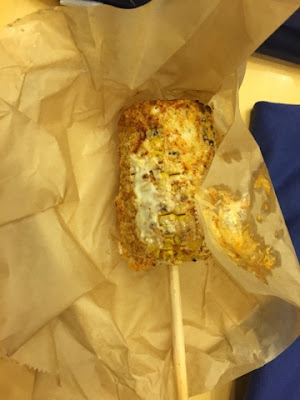 The next one was the corn on a stick that they sell at Think Blue BBQ. Since I didn't want corn all over my face when I spoke with the Dodger representatives, I again passed. I have heard great things though. Maybe a little less mayo if anything. This one gets a passed ball. 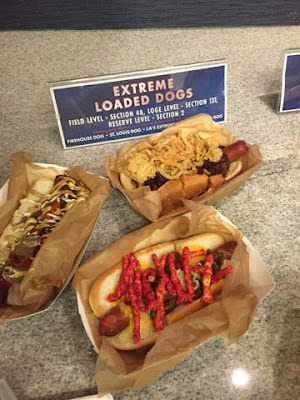 Here are three of the many extreme loaded dogs, of which I tried the top right one. Yum. This one was great, meat on meat. Carne asada on the Dodger Dog topped with onion rings. I liked the crunch with the dog (like the frito dog), so this one gets a triple, with an error, so you get to plate the run. 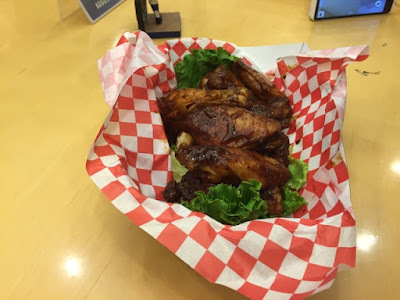 Finally, the BBQ chicken wings. Another winner. Sweet and messy with plenty of meat on the bone. As long as you have enough napkins, this was great. The meat fell off the bone nicely with just the right amount of sauce as to not overpower the taste buds. This is a ground rule double with the bases loaded. I also got to try the food in the stadium as well. I got the beef brisket that I thought had too much sauce thus overpowering the flavors. Also, if they could have toasted the bun it would have been nice. I popped out in my book. 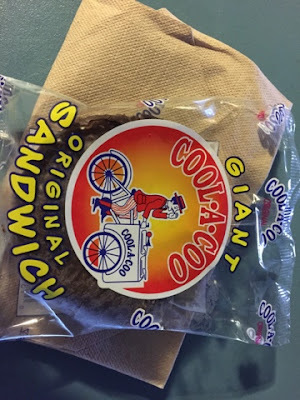 And for dessert, the good old Cool-A-Coo. Simple. Chocolate crunch with a oatmeal cookie and sweet vanilla ice cream. For some reason, to me they taste a little different than the old school ones, but I can't put my finger on it exactly. In any case, a solid dessert and I rate as a double off the wall. So there you have it, Dodger fans. Some great menu items for your curious culinary pleasure. There was also a pepperoni pizza that was good. In addition, Chef Tingley said that there was a surprise combination pizza in the works! Stay tuned!!! Everything has way too much spicy stuff on it for me. I guess I'm the minority now because I don't want flaming hot sauce on everything. 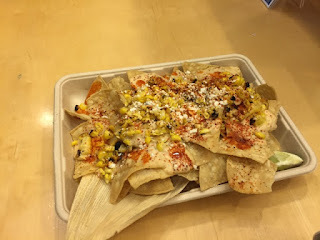 Is the food so bad that the only way to give it flavor is to add hot sauce? Give me a good philly cheesesteak or something with flavor. Gotta cater to the majority in the stadium, and I'm not it. 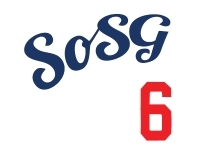 Gonna have to stick with the crappy Dodgers dogs for now. So this event was basically an "all you can eat" thingy for Dodgers bloggers? Don't they know the sons are from the "all you can drink" camp? @BJ - To be fair, there are a lot of food items available that aren't too heavy on the spices. These particular ones may be, but they are part of a separate effort to offer interesting twists on items including kicking it up a notch on the spices. "The meat fell off the bone nicely with just the right amount of sauce..."
Please tell me there's a Neeebs' mom joke in there somewhere.